The Moto X is a 2013 flagship Motorola device, shipping with Android Jelly Bean 4.2.2. 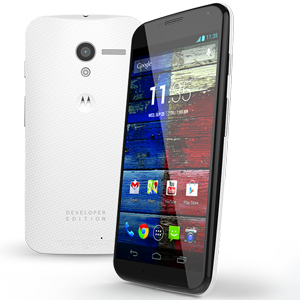 The Moto X is powered by a 1.7GHz Dual core processor, Adreno 320 GPU and 2GB RAM. The 4.7" AMOLED display has a resolution of 720x1280 and 312ppi pixel density. Internal storage is available in 16GB or 32GB. The camera is a reasonable 10MP with a 1.4um pixel size. Connecitvity is via 3G, LTE or dual band Wi-Fi. All this runs on a 2200mAh battery.